In a lot of ways, Aaron and I were made for each other. We both despise seafood (and he was born and raised in Hawaii, which makes it that much weirder). Neither of us like much on our burgers. We hate mustard and mayo. We were picky about our veggies (we've come a long way on that one together). But he doesn't like filled pasta. Which leads to him sort of picking at any ravioli or tortellini dish while I stare at him like, "It's cheese. Wrapped in pasta. WHAT IS NOT TO LIKE?!?!" But I had to try these. My pasta turned out a little too thick (it happens when you don't have a pasta roller) but we both agreed that the filling is amazing. Like, slather on a piece of toast and kick back in your favorite chair to enjoy with your eyes closed amazing. I've got some more in the freezer that I've been trying to come up with a good use for. But if you can get your pasta a little thinner (I'm kind of impatient) then these are absolutely worth the time and energy to make. 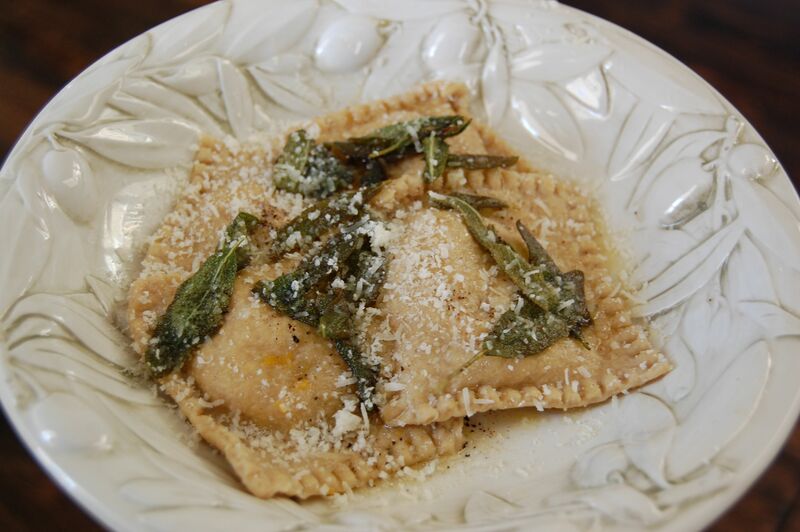 If you click over to where I originally got this one she has a recipe for sage butter to top the ravioli with. I did that the first time and it was really good but plain old melted butter with a sprinkling of parmesan is delicious too. Made these. HEAVENLY. Wow. I did the brown butter sage sauce I usually use over the store bought butternut squash ravs that I buy.